Do you prefer to use a thin pillow when sleeping on your side? If you’re looking for a low profile pillow to add to your collection, then there are several things you should remember when shopping for one. One is that a low profile pillow should be firm enough to keep your body in a horizontal line, and provide adequate support without misaligning your bed. It should also fill the gap between your ear and the surface of your bed, while keeping you comfortable throughout the night. Perhaps the reason you prefer a thin pillow is that it can easily be remolded, and you can easily place it in between your legs. However, remember that you should not get a pillow that it is too thin to lay low and create a downward bend in your neck. Of course, the price of the pillow is something that you will have to take into consideration. Prices of pillows range from budget to luxury prices. While it may sound preposterous to invest in a significantly priced pillow, there are people who are willing to shell that much money if it means getting a good night’s sleep on a regular basis. The material of the pillow is another factor that you will have to consider. If you are prone to allergies, then a pillow made of memory foam is a great choice. But if memory foam can be a bit too firm for your taste, you might want to settle with those made of synthetic fabrics that are hypoallergenic and washable. Dr. Breus Low Profile Pillow – People who sleep on their side most of the time will find this thin pillow perfect, as it provides enough padding without bending the neck. It is about 3.5 inches thick when expanded, and around an inch thick when you’re resting your head on it. This pillow is part of the product line designed by renowned clinical psychologist and author Dr. Michael J. Breus who also specializes in sleep disorders. Its synthetic fabric absorbs moisture, while its side panel construction has an advanced, spacer knit fabric that further enhances air flow. And its ultra-fresh treatment should provide this pillow with enough protection against allergens. This pillow is versatile as it is also ideal for stomach sleepers because it provides adequate support without causing back strain. Back sleepers will love it too due to its thin design preventing the chin from moving towards the chest, and potentially obstructing the airway. 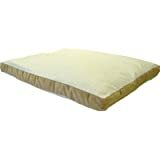 Ultimate Dreams Shredded Gel Memory Foam Low Profile Pillow – This shredded gel memory pillow gives you the luxury and comfort of a standard memory foam without the heat that memory foam pillows are notorious for. This memory gel foam pillow should give the perfect support to your head and neck, enabling you to retain a good alignment for your neck all through the night. And it’s not too firm nor too soft, with just enough firmness to provide comfort to the user, and conform with the contours of the neck and head. The foam would prevent the pillow from flattening or sagging, even after many years of use. In case you find the pillow flat or distorted in the morning, simply shake it and this pillow should go back to its fluffy self within seconds. Trim Sleeper Pillow from Hudson – This pillow is not only great for people who love to sleep on their side but also for stomach sleepers. It is a very thin pillow, with less than three inches in depth across its entire surface. To give you a better perspective, this means Hudson’s trim sleeper pillow is about half the thickness of your typical pillow. It is also filled with allergy-free polyester fibers. It is made by Hudson, a reputable company that makes comfortable and luxurious therapeutic pillows and mattress pads. Apart from the solid reputation of its makers, you’ll love that this is a reasonably priced pillow that is in the everyday price range. However, the Trim Sleeper Pillow is longer than your ordinary pillow. It measures 24 inches long, which is around three inches longer than an ordinary pillow. That said, you may be hard pressed to find a pillowcase for the Trim Sleeper Pillow. Sleep Innovations Memory Foam Classic Pillow – This is another affordable pillow that is within the budget price range. It provides the comfort and support you would expect from a memory foam, but this one is sized like a classic pillow. It feels soft when you rest your head on it, and it’s also designed for back and stomach sleepers as well. A key feature of this pillow is the patented SureTemp open cell memory foam that promotes enhanced airflow. With this pillow, you should feel cool and comfortable throughout the night. This pillow was designed to fit the body of its user. It responds to the user’s body weight and temperature, and softens and molds to conform to the contours of the head, neck, and shoulders. With this pillow in your bed you will no longer have to toss and turn around for much of the night. It will also aid in relieving pain and tension in the back, neck, and shoulder. Perfect Fit Firm Density Standard Size 233 Thread-Count Quilted Sidewall Pillow 2 Pack – This is another good option if you’re on a budget. For a reasobavle cost, you can add this thin pillow to your bedroom. This pillow is designed to help you enjoy a long rest as it provides adequate support to your head, neck, and shoulder. It can also give you the right spinal alignment so that you won’t wake up feeling sore, especially in the back. This pillow is filled with 100 percent hypo-allergenic polyester fill. There’s no way you’ll get allergies even if you spend most of the night hugging this pillow. You’ll also love that it has enough firmness — not too soft and not too firm — allowing you to enjoy sleeping on your side. Its sidewall is also quilted, providing superior support to the corded edges, eliminating any chances of breakdown. Simply put, you can bet that this pillow would last for years. Moreover, it won’t lose its fluffiness even after years of use. Indeed, it can be quite confusing to pick just one pillow given that all of them seem to have the same features. Hence you can’t be faulted if you just pick a pillow that has the lowest price. Undeniably, the price is one of the major considerations in choosing a pillow. Since times are hard, it is not surprising that the first thing you look for in a pillow is its price tag. However, there are other things that you have to look into. For instance, if you have chronic neck pain then you must look for a pillow that is slightly thick, or with enough height to keep your cervical spine parallel with the floor. But the pillow must not be too thick to cause your neck to bend upward. Moreover, the pillow should not be too thin because the tendency is that your neck will tilt downward, causing more neck woes. So the best pillow for side sleepers with neck pain is one that has enough elevation or support to keep the cervical spine parallel with the floor. Convenience is another factor that could come into play when you choose a thin pillow. Do you want a pillow that is machine washable? 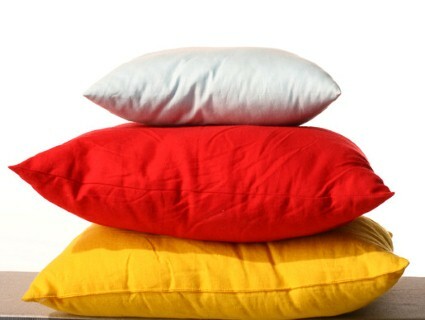 Would a cool pillow be enough for you to avoid turning and tossing and constantly changing position? These are just questions you have to answer when deciding the right pillow for you. This entry was posted on June 29, 2015 by admin.